Derrick Rose scores 29 points in Minnesota's win against Washington. Bojan Bogdanovic scores a season-high 37 points to help snap the Pacers two-game losing streak. Appeared in 10 games (all starts) for the Bulls in his fifth NBA season, averaged 15.9 points, 3.2 rebounds, 4.3 assists and 0.5 steals in 31.3 minutes... Suffered a right knee injury that ended his season on November 22, 2013. 2012-13 (Chicago): Missed the entire season with a left knee injury. 2008-09 (Chicago): Appeared in 81 games on the year (80 starts), and averaged 16.8 ppg, 6.3 apg, 3.9 rpg, 0.81 spg, 37.0 mpg, .475 from the field, .222 from downtown and .789 from the line … led the team in scoring 18 times, in rebounds four times and in assists 61 times … scored 20 or more points 32 times … dished out 10 or more assists six times and grabbed 10 or more rebounds two times … among Bulls rookies in team annals, he ranks second in minutes played, and third in points, points per game, assists, field goals made and field goal attempts … was named the 2008-09 T-Mobile Rookie of the Year … became the third Bulls rookie to ever win Rookie of the Year (co-winner Elton Brand 1999-00 and Michael Jordan 1984-85) … earned NBA Eastern Conference Rookie of the Month honors for November, December, and March (no other rookie claimed the award more than two times) … was crowned the champion of the 2009 PlayStation® Skills Challenge over All-Star Weekend in Phoenix, beating out Tony Parker, Devin Harris and Mo Williams … finished with four points and a team-high seven assists in 20:34 minutes in the T-Mobile Rookie Challenge & Youth Jam … among all rookies he ranked second in scoring, first in assists, second in minutes, fourth in shooting, seventh in free-throw shooting, eighth in steals and ninth in rebounds … his nine assists in his NBA debut are tied for the second-most by a No. 1 pick in his pro debut since the common draft began in 1966 (Jimmy Walker with 10 in 1967 and LeBron James with nine in 2003) … posted his eighth double-double of the year with 20 points and 11 assists, and added six boards and two blocks versus TOR (04/15) … recorded team highs of 24 points and eight assists at DET (04/13) … posted 22 points and seven assists versus CHA (04/11) … tallied 16 points and a team-high eight assists versus PHI (04/09) … scored 18 points and dished out six assists versus NY (04/07) … finished with 15 points, five assists and four rebounds versus NJ (04/04) … recorded his seventh double-double of the season with 24 points, 11 rebounds and six assists at IND (03/31) … finished with 23 points and a team high nine assists at TOR (03/29) … notched 16 points and team highs of nine boards and eight assists versus IND (03/28) … posted nine points, seven assists and five rebounds versus MIA (03/26) … scored 25 points, had five boards and four assists versus LAL (03/21) … scored 20 of his team-high 25 points in the second half when he made all 10 of his second-half field goal attempts in the Bulls’ 103-96 win at OKC; he was the first NBA player to go 10-for-10 or better in the second half of a game since Dwight Howard went 10-for-10 FG (03/14/07) at OKC (03/18) … finished with a team-high 20 points and six assists at PHI (03/13) … scored 23 points and grabbed nine boards at MIA (03/09) … tied a season high in points with 27 and dished out six assists versus MIL (03/06) … scored a team-high 22 points to go along with his eight rebounds and seven assists versus HOU (02/28) … posted a team-high 22 points and dished out five assists versus ORL (02/24) … scored 18 points and added nine assists, five boards and two steals at MIL (02/18) … finished with 23 points versus DET (02/10) … scored 22 points and dished out a team-high nine assists at DAL (02/07) … tallied 21 points, six assists and four boards at NO (02/04) … posted 26 points, six rebounds and four assists at PHO (01/31) … dished out a team-high 11 assists at SAC (01/30) … recorded 21 points (9-13 FG), a team-best six assists and four boards at LAC (01/28) … posted team highs of 20 points and eight assists at NY (01/19) … put up 16 points and six assists versus CLE (01/15) … notched his sixth double-double of the year with a team-high 25 points and 10 assists at TOR (01/14) … posted his fifth double-double with 13 points and 10 rebounds versus POR (01/12) … scored 22 points and added five assists and four boards versus MIN (01/03) … became the fifth Bulls rookie to record at least 20 points and 10 assists in the same game, joining Michael Jordan, Reggie Theus, Kirk Hinrich and Jay Williams, when he netted his fourth double-double of the year with 21 points 2008-09 cont’d: and a season-best 13 assists at NJ (12/29) … set a season high with 27 points (12-19 FG) and added seven assists and four boards at ATL (12/27) … posted 24 points, five rebounds and three assists versus UTH (12/20) … had 16 points and seven assists versus LAC (12/17) … finished with 22 points, six assists and six boards versus NJ (12/13) … recorded his third double-double of the year with 12 points and 11 assists, along with four boards at MEM (12/12) … posted 15 points and dished out a team-high seven assists versus NY (12/09) … had 15 points and eight assists versus WAS (12/06) … scored 18 points, dished out nine assists and had a season-high four steals at MIL (12/03) … scored a team-high 24 points and grabbed six boards versus PHI (12/02) … posted his second double-double of the year with 18 points and 10 assists at PHI (11/30) … notched a team-high 25 points to go along with his team-high nine assists at UTH (11/24) … finished with 15 points, six assists and a season-high two blocks at DEN (11/23) … scored 23 of his 25 points in the second half and added five assists at GS (11/21) … tallied 25 points and nine assists at LAL (11/18) … became the first Bulls rookie since Michael Jordan in 1984-85 to score 10 or more points in the first 10 games of his rookie season versus IND (11/15), when he scored a game-high 23 points and added eight assists … posted the first double-double of his career with 26 points and 10 boards, while also dishing out a team-high six assists versus ATL (11/11) … scored 18 points and dished out six assists versus PHO (11/07) … posted 20 points and seven assists at CLE (11/05) … with his game-high 26 points and six boards versus MEM (11/01), he became the first Bulls rookie since Michael Jordan in 1984-85 to score 26-or-more points in the first three games of his rookie season … in his NBA debut versus MIL (10/28), he finished with 11 points, nine assists and three steals, and joined LeBron James as just the second player to record at least 11 points, nine assists and three steals in his NBA debut (dating back to 1973 when the NBA began recording steals for individual players) … missed one game due to a right wrist contusion (03/24) … 2009 Playoffs: Started all seven games and averaged 19.7 ppg, a team-high 6.4 apg (eighth in NBA), 6.3 rpg, a team-high and NBA postseason-high 44.7 mpg and shot .492 from the field and .800 from the line … posted 28 points, eight rebounds and seven assists in 59:26 minutes of action in Game 6 versus BOS (04/30) … scored 14 points to go along with his eight boards and six assists in Game 5 at BOS (04/28) … nearly notched a triple-double with team highs in points (23), rebounds (11) and assists (nine) in 48:44 minutes of play in Game 4 versus BOS (04/26) … scored 10 points, handed out seven assists, grabbed six boards and blocked two shots in Game 2 at BOS (04/20) … tied Lew Alcindor’s NBA-playoff record for most points by a rookie in his playoff debut with 36 points (12-19 FG, 11-11 FT), and added 11 assists, three rebounds and one steal in 49:33 of play in Game 1 at BOS (04/18) … became just the second player in NBA playoff history, joining Chris Paul, to post 35 or more points and 10 or more assists in his playoff debut. Selected in the first round (first overall) by the Chicago Bulls in the 2008 NBA Draft (06/26/08) … re-signed by Chicago (12/21/11). Named Third Team All-American by the AP and the NABC … earned First Team All-Conference USA honors … named Conference USA Freshman of the Year and earned All-Freshman Team honors … selected as a finalist for the Wooden Award … appeared in all 40 games (39 starts) for a Memphis squad that went 38-2 and set an NCAA men’s basketball record for wins in a season … led the team in assists (4.7 apg, ranked fourth in Conference USA) and ranked second in scoring (14.9 ppg, eighth) … scored 20 or more points nine times … shot 7-for-12 from the field, including five three-pointers, en route to 26 points at Cincinnati … tallied 24 points and six boards at Connecticut … registered 23 points, five rebounds, five assists and a career-high four steals against Tennessee … just missed a triple-double with 19 points, eight rebounds and nine assists against Gonzaga … pulled down a career-high 10 rebounds versus USC … posted his first career double-double with 19 points and a career-high 12 assists against Austin Peay … handed out 11 assists versus UAB … recorded 17 points, nine rebounds and seven assists against Mississippi State in the second round of the NCAA Tournament … led the Tigers with a career-high 27 points against Michigan State in the Sweet Sixteen … posted 21 points, six boards and nine assists against Texas in the Regional Finals, on his way to South Region MVP honors … made 11-of-12 from the line en route to 25 points and added nine rebounds against UCLA in the Final Four … scored 18 points, grabbed six rebounds and dished out eight assists versus Kansas in the National Championship Game … selected to the NCAA Tournament All-Final Four Team. 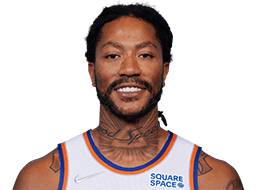 Full name is Derrick Martell Rose … son of Brenda Rose … nickname is “Pooh” … has one son, Derrick, Jr. … was one of 25 top rising NBA players who participated in the 2009 USA Basketball Men’s National Team mini-camp … was an early-entry candidate for the 2008 NBA Draft … was a member of the USA Basketball Junior National Select Team that defeated the World Select Team at the 2007 Nike Hoop Summit held in Memphis, Tenn. … rated the nation's top high school point guard as a junior, and again his senior season ... named to the USA Today 2007 All-USA Team (First Team) ... selected to the 2007 Parade Magazine All-America Team; it was the third year in a row that he was named to one of Parade's All-America squads (2005 Third Team; 2006 Fourth Team) ... named 2007 Illinois Mr. Basketball by the Chicago Tribune ... a two-time Illinois All-State selection (2006, 2007) ... led Simeon Career Academy to a 33-2 record and the Illinois Class AA Championship in 2007 … his senior year he averaged 25.2 ppg, 9.1 rpg, 8.8 apg and 3.40 spg and shot .590 from the field ... scored just two points in the title game, but had eight assists and seven boards in the 77-54 win over O'Fallon ... helped Simeon become the first Chicago Public League team to win back-to-back state titles in Illinois prep history … guided Simeon to a 33-4 record and the Illinois Class AA Championship in 2006 … his teams went 93-10 (.903) during his four years at Simeon … hosted the Chicago Housing Authority’s 11th annual Kids Holiday Party at the Museum of Science and Industry … participated in a holiday party for Chicago Housing Authority children as well as USO families, who had loved ones serving overseas during the holidays in 2008 … distributed gifts to children and helped decorate Christmas trees that were later donated to CHA senior facilities … attended the Chicago Housing Authority’s ninth Annual Holiday Party at the Shedd Aquarium, in which he toured exhibits with 400 children and distributed holiday gifts to each child in attendance … created a PSA against violence in the household for Prevent Child Abuse America … hosted a tribute event in honor of Dr. Martin Luther King, Jr. at the MLK Boys and Girls Club in Chicago … participated in the Chicago Bulls Division Navy Recruit Swearing-in Ceremony at the Berto Center … hosted the Derrick Rose Basketball Camp in Deerfield, Ill. in August 2009 … featured in the Greater Chicago Food Depository “Helping the Hungry for 30 Years” campaign to thank those who have contributed to Chicago’s food bank … helped teach a hoops clinic for children from the Middle East in the Play for Peace basketball clinic at the Seeds of Peace International Camp in Otisfield, Maine in July 2008 … participated in the Bulls Basketball Camp at the Bulls/White Sox Training Academy in August 2008.